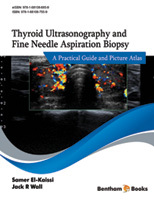 Ultrasound examination of the anterior cervical lymph nodes constitutes an important component of thyroid ultrasound. Up to 30% of thyroid cancer patients are found to have cervical lymph node metastasis on the pre-operative ultrasound examination, leading to altered surgical management. There are six anterior cervical lymph node compartments that are examined systematically on ultrasound beginning with compartments I and VI/VII, followed by compartments II, III and IV and finally compartment V. Low-suspicion cervical nodes are oval in shape with an intact fatty hilum and central vascularity. Intermediate suspicion nodes are those with an absent hilum and round shape defined as a nodal long-axis to short-axis ratio less than 2, or a short-axis ≥ 8 mm in compartment II nodes and ≥ 5 mm in compartments III and IV and VI. In addition to these changes, high suspicion nodes display one or more of the following features: microcalcifications, cystic change, hyperechoic component, irregular margins, and/or peripheral/chaotic vascularity. Nodal microcalcifications and cystic changes on ultrasound have the highest specificity for metastatic thyroid cancer followed by hyperechogenicity, peripheral vascularity and a round shape. Suspicious cervical nodes should be further evaluated with ultrasound-guided fine needle aspiration biopsies and measurement of tumour markers in the needle washout.